Popular Science Blog - What's Your Web-Surfing Fingerprint Look Like? Yeah, but is it art? It would be interesting to compare the fingerprints created by using different applications or games though. I would bet there's a similar look to similar apps. This could be used to make apps and games more efficient. Doesn’t seem like much but over an apps life it could save time. Also it could help reduce physical stress on the end user. Funny thing is the picture is of a USB mouse, not a serial mouse like the article referres to. "Funny thing is the picture is of a USB mouse, not a serial mouse like the article referres to." I wonder what the S in USB stands for? 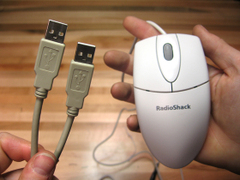 Use mouse (1st USB) and ergoclick (2nd USB) to make mousing easy, fast, safty and ... without lifting a finger. Interesting... It seems like there should be a much easier way to accomplish this, on one computer. I thought there were 'keylogger' type programs that had the ability to track mouse movements. If so, that kind of feature could be used to make these pretty pictures. The link for the directions dosn't work. Does anyone know the link to the 'how-to'? It doesn't work. I'm sure that could be done without hardware tweaking. 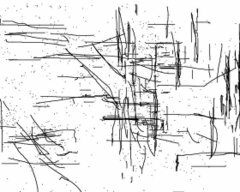 You just need some API functions that track the mouse cursor at a given sampling interval, then dump the coordinates somehow into an image. Sort of the some guy's key logger. You just need a programmer with time. The easiest, but probably the worst option is to tape two mice together. You might need a bigger hand. I guess this could be opened to a larger philosphical debate on "what is art". yuck, i'll stick with science, thank you. Attaching two mouse together is a work for free time, may be for fun but not for art. This is neither for the knowledge nor is the solution for any problem.